The following games are played by teams, which are formed on the basis of mutual understanding, respect and coordination. By playing these games, transcultural features are assimilated by the young and it induces them to promote national and international integration. Thus these games promote the young in the process of nation- building. Hockey's birth place is Asia and Persia is credited with having devised it about 2000 B.C. It is said that Greeks and Romans played hockey but nothing is known about the nature of the game that they played. The earliest mention of the present day game dates back only to 1527, when the Galway Statutes included 'hokie'- the hurling of little ball with sticks or staves in a list of prohibited games. Modern hockey, as created in England, resembles closely games once popular in the British Isles and there is no doubt that hockey's immediate fore-runners were the Scottish shinty, the English and Welsh bandy and the Irish hurling. The game has witnessed numerous refinements over the years. Hockey became popular in India when the British Regiments played the game in India and introduced it in the British India Regiments who quickly picked up the game. The first hockey club was formed in Calcutta in 1885-86 followed by Bombay and Punjab. The Bengal Hockey was the first Hockey Association in India founded in 1908. The second was formed in 1920 in Karachi by the name 'Sind Hockey Association'. In the Olympic games, India played hockey for the first time in 1928 held in Amsterdam. She reached the finals defeating Austria, Belgium, Denmark and Switzerland. 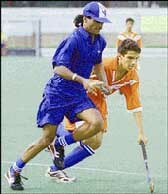 In the final, India defeated Holland by three goals to nil. Hockey is the National Game of India. Unmatched excellence and incomparable virtuosity brought India a string of Olympic gold medals. The brilliant Indians brought a touch of black magic to their play and the ball juggling feats of the Indians were a sheer delight. The Golden Era of hockey in India was the period from 1928 - 1956 when India won 6 consecutive gold medals in the Olympics. During the Golden Era, India played 24 Olympic matches, won all 24, scored 178 goals (at an average of 7.43 goals per match) and conceded only 7 goals. The two other gold medals for India came in the 1964 Tokyo Olympics and the 1980 Moscow Olympics. In 1956, after India won the last of its six consecutive gold medals, the manager of the Pakistan hockey team, Riazuddin Ahmed said, "This is the first time that we played with India in the Olympics. The next time we play, the result will be different." His prophetic words came true in 1960, when after 28 consecutive victories in the Olympic Games, India lost 0-1 to Pakistan in the 1960 Rome Olympics final. The Bharatiya Hockey Andolan is a non-profit organization for raising the standard of hockey in India to world class standards. To achieve the above, the Andolan has focussed on an existing institutional setup - the university system of India, and created a framework for producing sporting talent out of this hitherto neglected resource base. The framework to be provided is the inter-university Dhyan Chand Tournament. 1995 was the inaugural year when the Andolan hosted the tournament with the Maratha Conference (total of 6 universities), covering the state of Maharashtra. In 1996, Ahimsa Conference (6 universities), which covers the state of Gujarat are also being included. In 1997, the Adi Sankara Conference (10 universities of Kerala), Chola Conference (7 Universities of Tamil Nadu), Sri Venkateswara Conference (8 universities of Andhra Pradesh), and the Vijayanagara Conference (6 universities of Karnataka) were included. At this stage 43 universities, spanning Western and Southern India, have been covered by the tournament. In 1998, the Rajput Conference (5 universities of Rajasthan), Sanchi Conference (8 universities of Madhya Pradesh and environs), Indraprastha Conference (8 universities of Delhi and environs), and the Taj Conference (8 universities of Uttar Pradesh) were covered. 1999 focus was on East India. The tournament will include the Kalinga Conference (7 universities of Odisha), Durga Conference (9 universities of Bengal), Nalanda Conference (9 universities of Bihar), and the Ganga Conference (9 universities of Uttar Pradesh). This leaves the frontier areas of India. In year 2000, the tournament included Brahmaputra Conference (5 universities of the North-East), and the Kurukshetra Conference (9 universities of Haryana, Punjab and Jammu and Kashmir). This results in a grand total of 120 Division I universities in the country. This game of basketball was conceived in the United States of American in 1891, invented by Dr. James Naismith. It is a high-speed ball game and has become popular in India. The team for basketball consists of 12 players but only five are allowed on the court. The aim is to put the ball in the opponent's basket. Thus a team can gain 2 points and a free throw yields one point. Games last for 40 minutes, which consists of two halves of 20 minutes each. The teams can call "time-outs' of one minute twice in each half for tactical reasons, say to regroup or recover. A player can take only 2 steps while holding the ball but any number while bouncing the ball with one hand. The game begins with a "jump-ball" at the center circle. Two players, one from each team, stand in the center circle and the referee throws the ball up between them. The players jump up and try to tap the ball towards a member of their own team, in order to win the possession. Bicycle polo requires10 players. It is just the usual polo but played in an open- frame bicycle. An Irishman invented it in 1891 but it is also popular in India these days. A smaller pitch is used, and a team consists of 6 members and the rest four are reserve. Players play the game five-a-side manipulating a light mallet with a cylindrical head, while manipulating a skeleton bicycle at racing speed. The ball used is bamboo and the field measures 80-110 yards by 60-90 yards. It is divided into four equal sections by lines marked parallel to the goal lines. Goals are scored as in hockey by hitting the ball under the crossbar and between the uprights. The goal, placed centrally on the goal line consists of two upright posts 4 yards apart with a crossbar 9 ft from the ground. A semi-circular penalty area in front of each goal is marked by a line along a radius of 15 yards from the center of the goal line. The game is played fast and furiously in sections of 15 minutes each. Players can strike or intercept the ball with any part of the body or cycle, but must not catch, hold or throw the ball, nor should they dismount. If the ball goes over the sidelines, a member of the innocent team takes a free hit from that point. The game of cricket originated in the West sometimes in the 18th century as a sport of the elite and the educated. A club in Hampshire contributed towards the growth of the game in its early stages. Cricket was introduced into India by the British residing here around the middle of the 19th century. But the game became popular through the efforts of a small affluent community of Parsis. A match is played between eleven players on each side. One of the players on each side shall be called the captain. If the captain is not available then he can appoint a deputy on his behalf. Before the toss for the innings, the captain shall nominate the players. They shall not be changed till the end of the game without the consent of the opposite side captain. The pitch is the area between the bowling creases. It measures 5ft/1.52m in width on either side of a line joining the center of the middle stumps of the wicket. The sets of wickets, of 9 inches/22.86cm width each and consisting of 3 wooden stumps with two wooden bails at the top, shall be pitched opposite and parallel to each at a distance of 22yards/20.12m between the centers of the two middle stumps. In the middle of the last century, boys in established English Public schools and Universities such as Cambridge began to play a kind of football, which bears some resemblance to the present day football. The oldest football league club was formed in 1862. In 1863 the Football Association was formed in London. Football is the second most popular game in India next to cricket. The British Army in India first played organized football in 1880. Football is one of the legacies left to us by the British. The Indian Football association of Calcutta is the oldest state level football organization formed in India in 1893. India entered the international field in football as an independent nation in 1948, when the India team participated in the London Olympics. But India had never won a medal in Olympics football. However she has won the Asian Games Soccer in the Delhi and Jakarta Games. Since 1964 India has not participated in the Olympics event of Football. 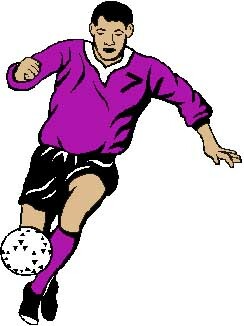 The trophies for football in India are, Durand Cup, Santosh Trophy, Rovers Cup, Federation Cup, Jawaharlal Nehru gold Cup. Handball is played either outdoors or indoors. Two opposing teams play it. There are 12 members in two teams and 10 are court players and two are goalkeepers. But at any time players more than 7 should not enter the court. Six of them are court players and one is the goalkeeper. The remaining five are substitutes. There should be none in the goal area except the goalkeeper. A field is of 80 to 150 yards by 45 to100 yards with goal circles of 10 yards radius, a penalty spot 14 yards infield from the middle of each goal, goal posts 8 yards and 8ft high, a center circle of 10 yards radius and an offside line 18 yards inside and parallel to each goal line. The ball should be spherical with a rubber bladder in it. Its outer covers shall be made of leather of one color or of synthetic material. The weight of the handball shall not be more than 474 gms and diameter of the ball shall be from 58 to 60 cms. A match starts from the center point, the ball being passed with long or short throws from one player of a team to the other and in this way attacks are built up which culminate in attempts at scoring. A valid goal is scored when the ball passes through the goal line of the opponents through the goal posts under the cross bars provided the scorer or any player of his team has not violated the rules. The goals shall not be scored against the opponents by direct throw on. Kabaddi is also known as Hututu, Do-do and Ghidugudu. It is an ancient mass based group game, which is played in most of the tropical countries of Asia. It is popularly known as Hadudu in Bangladesh, Gudu in Sri Lanka, The Chub in Indonesia, Kabaddi in India and Pakisthan and dodo in Nepal. The playground should be level and soft. It shall be made of earth, manure or saw dust. The ground shall be 12.5 m X 10 meters. Middle line shall divide it into two equal halves. Each half shall measure 10 meters x 6.25 meters. There shall be strip of one meter wide on each side of the play field, which is called lobby. Though kabaddi is primarily an Indian game, not much is known about the origin of this game. There is, however, concrete evidence, that the game is 4,000 year old. It is a team sport, which requires both skill and power, and combines the characteristics of wrestling and rugby. It was originally meant to develop self defence, in addition to responses to attack, and reflexes of counter attack by individuals, and by groups or teams. It is a rather simple and inexpensive game, and neither requires a massive playing area, nor any expensive equipment. This explains the popularity of the game in rural India. Kabaddi is played all over Asia with minor variations. Kabaddi is known by various names viz. Chedugudu or Hu-Tu-Tu in southern parts of India, Hadudu (Men) and Chu - Kit-Kit (women) in eastern India, and Kabaddi in northern India. The sport is also popular in Nepal, Bangladesh, Sri Lanka, Japan and Pakistan. The side winning the toss sends a 'raider', who enters the opponents' court chanting, 'kabaddi-kabaddi'. The raider's aim is to touch any or all players on the opposing side, and return to his court in one breath. The person, whom the raider touches, will then be out. The aim of the opposing team, will be to hold the raider, and stop him from returning to his own court, until he takes another breath. If the raider cannot return to his court in the same breath while chanting 'kabaddi', he will be declared out. Each team alternates in sending a player into the opponents' court. If a player goes out of the boundary line during the course of the play, or if any part of his body touches the ground outside the boundary, he will be out, except during a struggle. The team scores a lona ( a bonus of two points), if the entire opposition is declared out. The game then continues by putting all the players on both sides. Matches are staged on the basis of age-groups, and weight. Seven officials supervise a match - one referee, two umpires, two linesmen, a time keeper and a scorer. The 'Surjeevani' form of Kabaddi is played under the Kabaddi Federation of India, and is governed by its rules and regulations. In the 'Surjeevani' form of Kabaddi, one player is revived against one player of the opposite team who is out. i.e. one out, one in. The duration of the game, the number of players, the dimensions of the court, etc. have been fixed by the Kabaddi Federation of India. In the 'Gaminee' type of Kabaddi, there is no revival. When all the players of team are out, the game ends. So there is no time limit in this category. In the 'Amar' form of Kabaddi, whenever any player is touched (out), he does not go out of the court, but stays inside, and one point is awarded to the team that touched him. In this way, one point for each touch of the opposite team, i.e. to the team who touches the anti player. This game is also played on a time basis, i .e the time is fixed. In the northern part of the country, i.e. Punjab, Haryana, Uttar Pradesh and Delhi, this game is played in a circle. This is known as 'Circle Kabaddi' or Amar Kabaddi. If it is played without a court, as in some places, it's called 'Goongi Kabaddi'. The Goongi Kabaddi is nothing but wrestling between two players. The first world Kabaddi championship in the history of the game, was organised in Hamilton when approximately 14,000 people packed Copps Coliseum, to watch stars from India, Pakistan, Canada, England, and the United States compete. The Kabaddi Federation of India (KFI) was founded in 1950, and it compiled a standard set of rules. The Amateur Kabaddi Federation of India (AKFI) was founded in 1973. The AKFI has given new shape to the rules, and it has also the rights of modification in the rules. The Asian Kabaddi Federation was founded under the chairmanship of Mr. Sharad Pawar (Maharashtra). Some of the Arjuna Award winners are Sh. Sadanand Mahadeo Shetty, Sh. Shakuntla Panghar Kholavakar, Sh. Shantaram Jaatu, Kumari Monika Nath, Kumari Maya Kashi Nath, Rama Sarkar etc. 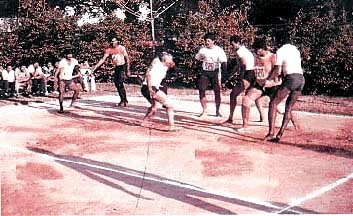 Kabaddi was one of the demonstration games at Asiad '82. This game of KHO-KHO is reported to be as old as the Mahabharata. The word Kho is derived from the Sanskrit verb"Syu" which means, "get up and go". KHO-KHO is played in two innings, by 12 nominated players out of 15 players. Initially 9 players start the game and 3 are kept as reserve. Each team has to chase and defend for 9 minutes twice in a match. The Khokho playground is rectangular and 27 meters long and 15 meters wide. There are 2 rectangles at the end. One side of the rectangle is 16 meters and the other side is 2.70 meters. In the middle of these two rectangles there shall be two wooden poles. The central lane is 21.6 meter long and 30 cms wide. There are 8 small squares 30 cms x 30 cms on the lane. At the end of the central lane two posts shall be fixed. Kho-Kho ranks as one of the most popular traditional sports in India. The origin of Kho-Kho is difficult to trace, but many historians believe, that it is a modified form of 'Run Chase', which in its simplest form involves chasing and touching a person. With its origins in Maharashtra, Kho-Kho in ancient times, was played on 'raths' or chariots, and was known as Rathera. Like all Indian games, it is simple, inexpensive and enjoyable. It does, however, demand physical fitness, strength, speed and stamina, and a certain amount of ability. Dodging, feinting and bursts of controlled speed make this game quite thrilling. To catch by pursuit - to chase, rather than just run - is the capstone of Kho-Kho.The game develops qualities such as obedience, discipline, sportsmanship, and loyalty between team members. The rules of the game were framed in the beginning of the 20th century. At Gymkhana Poona, a Committee was formed in 1914, to frame its rules. The first ever rules on Kho-Kho were published from Gymkhana Baroda, in 1924. In 1959-60, the first national Kho-Kho championship was organised in Vijayawada (Andhra Pradesh). The Government has initiated the following awards for the game: Arjuna Award, Eklavya Award for men, Rani Laxmi Bai award for women, Veer Abhimanyu award for boys under 18, and Janaki award for girls under 16. Each team consists of twelve players, but only nine players take the field for a contest. A match consists of two innings. An innings consists of chasing and running turns of 7 minutes each. Eight members of the chasing team sit in their eight squares on the central lane, alternately facing the opposite direction, while the ninth member is an active chaser, and stands at either of the posts, ready to begin the pursuit. Members of the chasing team have to put their opponent out, touching them with their palms, but without committing a foul. All the action in Kho-Kho is provided by the defenders, who try to play out the 7 minutes time, and the chasers who try to dismiss them. A defender can be dismissed in three ways: 1) if he is touched by an active chaser with his palm without committing a foul, 2) if he goes out of the limits on his own, 3) if he enters the limit late. Defenders enter the limit, in batches of three. After the third and last defender of batch is out, the next batch must enter the limits, before a 'kho' is given by the successful active chaser. Defenders have full freedom of movement on both sides of the central lane, but the active chaser cannot change the direction to which he is committed. He cannot cross the central lane. An active chaser can change position with a seated chaser, by touching him from behind by palm, and uttering the word 'kho' loudly, and simultaneously, chase or attack is build up through a series of 'khos' as the chase continues with a relay of chasers. At the end of the innings there is an interval of 5 minutes and an interval of 2 minutes, in between the turns. Each side alternates between chasing and defence. Kho-Kho can be played by men, women, and children of all ages. The game requires a very small piece of evenly surfaced ground, rectangular in shape, and 27m by 15m. The only equipment required are the two poles. The game lasts no more than 37 minutes. National Championships, Junior National, Sub Junior National Championship, School Championship, Mini School Championship, Primary Mini School Championship, National Women Championship, All India Inter University Championship and Federation Cup. The primary sports body for this game is called the Kho-Kho Federation of India (K.K.F.I.). It has its branches in all the states and it has been conducting Mini, Junior and Open National Championships for both sexes, in many parts of India. Shri Shekhar Dharwadkar, Shri Shrirang Inamdar, Usha Nagarkar, Nilima Sarolkar, Achala Devare. To be "Runner" or "Chaser" shall be decided by lots. Kho should be given to a sitting chaser in loud and clear voice. The sitting chaser cannot stand without getting the Kho. Whenever there is a foul, the active chaser will have to go in the reverse direction in which he was originally going. All chasers except one shall sit in their squares such that no two of them face each other. The ninth active chaser will stand in the rectangle near some pole lane. No part of the active chaser's body will touch the central lane. After giving the Kho, the active chaser will take the place of the chaser. When an active chaser has taken a direction, he shall go in that direction till he reaches the rectangle. Unless he gives a kho, the active chaser shall not go to the other side of the central lane. A runner is declared out if his both feet are out of the limits. This is one of the exciting field events in which the collective strength of the team is tested. This game is of historical significance and is now even played in village areas during fairs and festivals between members of two adjacent villages. This is the best way to judge the collective efforts of a team's work. Apply uniform force in coordination with the others. At no stage should one slacken one's effort, as it would break the chain of strength being applied. The teams shall consist of equal number of members with a maximum of eight. All knots shall be won by two pulls out of three. The teams shall change ends after some rest and after a pull. The rope shall not be less than 4 inches and not more than 5 inches in circumference and not less than 32 m for 8 competitors on each side. From the start the rope shall be caught. Every pulling member shall hold the rope with both the hands and the rope shall pass under the armpit. The end or anchorman may grip the rope and pass it over one's shoulder. One of the prominent and popular indigenous sports of India is archery. Archery is an intrinsic part of the culture of the local people, and plays a principal role in their festivals. The bows and gut are made of a special bamboo, and are of varying lengths and sizes. The arrows are made from special reeds, topped with a pointed metal cap, using eagle feathers. The feathers are interwoven near the neck on four sides, this part of arrow - making being the domain of the women. The target is made from a certain kind of grass, and is circular in shape, 8 to 10 inches high and 3 inches in diameter. The target is affixed on a thin bamboo pole, at a height of 3 1/2 ft from the ground. A notch is made at the base of the pole and any arrow hitting below the notch, is not counted for points. The distance exceeds 30 metres. There are three ways of conducting this contest : individual competition, team competition, and fast and slow shooting.